Happy Thanksgiving to you and your human, Mudpie! Happy Thanksgiving! We hope you have a wonderful day! Love the picture! 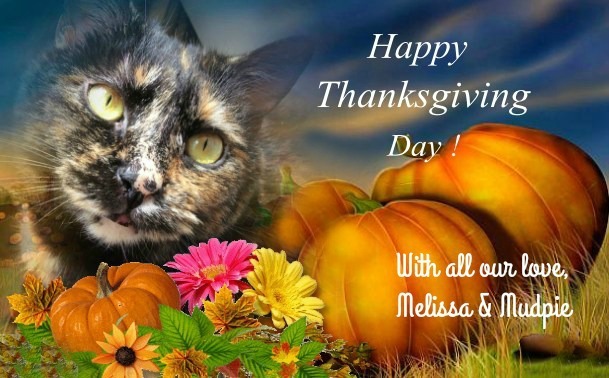 Allegra, Ruby and I wish you and Mudpie a wonderful Thanksgiving! That's a beautiful picture, Mudpie. Happy Thanksgiving to you and your mom and all the rest of your family! Beautiful! Happy Thanksgiving, Melissa and Mudpie! Happy Thanksgiving Mudpie and Melissa. That is a beautiful graphic you shared! We are thanksful to know you! Happy Thanksgiving! All the best to you, Mudpie and Melissa! We celebrated Canadian Thanksgiving back in October. Happy Thanksgiving to you and your human, too, Mudpie! Our wish is that love be bountiful this Thanksgiving for you and your's from La Condo Keisha. Happy Fankgivin' to ya'll. We are so blest to have ya'll in our lives. Fanks fur bein' our furiends. Big hugs to you both. Happy Thanksgiving! We are thankful for your friendship. What a beautiful graphic! We are so grateful for you and your friendship. Happy Thanksgiving, Melissa and Mudpie! Happy Thanksgiving !! We love you both! I am looking forwArd to lots of books but Silence Fallen (Mercy Thompson, #10) Is definitely one Wicked Abyss (Immortals After Dark, #18) is another...Shadow's Seduction (Immortals After Dark, #17; The Dacians, #2) as well... Untitled (Anita Blake, Vampire Hunter, #26) can't wait to read her new book!!! !